This blended malt is made using 83% A, 9% B, 4% C and 4% D.
Nose (90): more than average. honey, citrus, vanilla, floral. Palate (90): powerful, oily. honey, citrus, vanilla, cinnamon, wood. Finish (90): longer than average. honey, spices, vanilla. So based on other whiskies I have already tasted I rate this Reference Series I with 90 points over 100. This blended malt is made using 67% A, 13% B, 10% C and 10% D.
Nose (89): more than average. honey, toffee, vanilla, creme brulé, cardamom, wood. Palate (88): powerful, oily. honey, wood, citrus, cinnamon. So based on other whiskies I have already tasted I rate this Reference Series II with 88 points over 100. 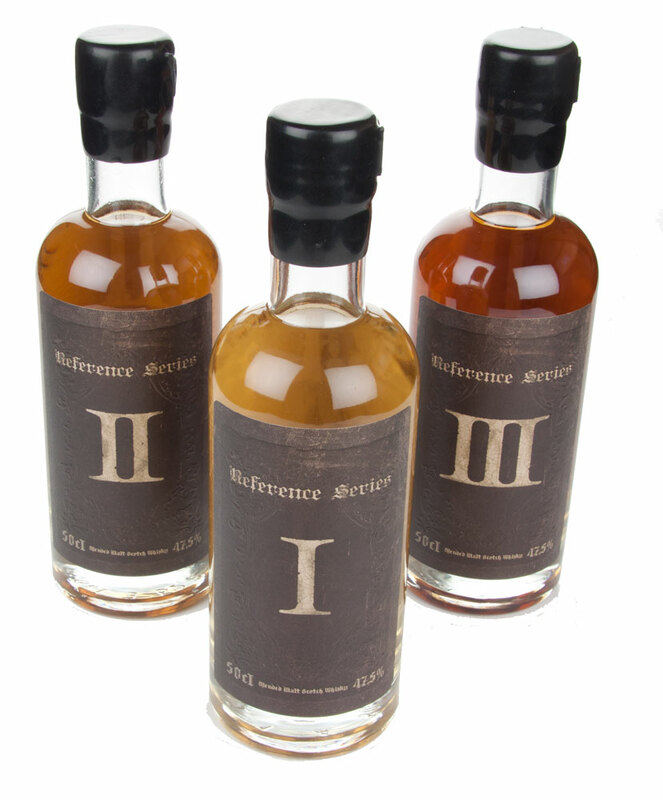 This blended malt is made using 36% A, 10% B, 19% C and 35% D.
Nose (91): more than average. honey, wood, dates, candies, raisins, vanilla, flowers. Palate (90): powerful, oily. honey, citrus, raisins, wood, vanilla, liquorice. Finish (90): longer than average. honey, liquorice, spices. So based on other whiskies I have already tasted I rate this Reference Series III with 90 points over 100. Well, I wasn’t aware that these whiskies were blended malts. Fantastic stuff. Bang for the buck I would buy the Reference Series I as it reminds me of anCnoc… really soft with lots of vanilla and honey. I am looking forward to see the next bottles of this fantastic idea. You can buy them at Master of Malt either as full bottles or small samples.